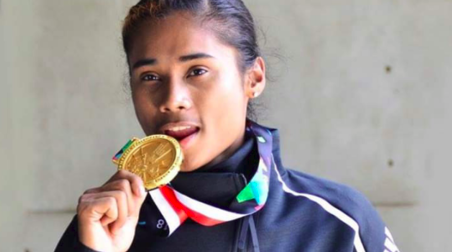 Assam’s sprint queen Hima Das has arrived in Dhing to appear for her higher secondary final examination. A student of Dhing College, she greeted her invigilator and history teacher Biman Hazarika with a simple “Good morning, sir”, which reduced him to tears, reports The Telegraph. “Today we have got back the same Hima in this hall that we found in the classrooms years ago. The talkative, slim girl with a smile on her face,” Hazarika said. Hazarika, an assistant professor in the college, was the invigilator during the first day of the examination on Tuesday. Altogether 269 students appeared for the exam from Dhing College this year. “We have made a special arrangement in an extra room for Hima and will continue doing so till the end of her examination. Geography on March 9 is her fourth subject and that will be her last paper,” Dhing college Principal Sarat Dutta said. Hima, had been practicing in Turkey, before reaching her home spent to appear for her first exam hall on Tuesday morning. She was in her school uniform. Dhing, 15km from Nagaon, is now known for Hima and her world record. Hima, accompanied by her security guards, arrived in an Innova for the exam. “My aim is to complete my college studies at any cost and for that I rushed to Dhing. After completing my examination I will return to Turkey,” Hima said. “I must finish my graduation and I will do that from Dhing College,” she said. 18-year-old Hima, completed her schooling from her local high school and got admitted to higher secondary first year (Arts) in Dhing College in 2016. She left her college without appearing for the final examination last year because of her busy schedule.